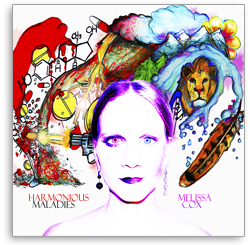 Click Here To Download Melissa’s Critically-Acclaimed Album “Harmonious Maladies” now for just $12.95! From the powerful call to arms “Courage” to her hilarious homage to Princess Leia “To Carrie Fisher with love,” the sunny Hawaiian vibes of “Maluaka Beach” to her haunting rendition of The Offspring’s “Gone Away,” Melissa weaves an intricate sonic tapestry using threads from her broad range of musical influences. Produced and co-engineered by Melissa herself, she has thrown everything but the kitchen sink at this deep, dense album. Featuring medieval-sounding hammered dulcimer, mandolin, piano, thick synth vibes, fiddle, ukulele, lap steel guitar, angelic choirs, and so much more, no two tracks on this album sounds even remotely the same – a testament to Melissa’s versatility and her refusal to be pigeon-holed into one genre. You will receive Melissa’s album “Harmonious Maladies” digitally in high-quality mp3 format along with lyrics, liner notes, and digital album artwork, usable on most devices (iPod, smartphone, computer, etc.). Rates are in US dollar.